The RV Hobo Network, simply put offers the most full featured kampground hosting on the Internet, and you can easily customize it. Start off with our <i>beyond compare</i> reservation system, our <i>beyond believe</i> websites and our full blown user Kommunities. To understand what our Kampground Kloud has available for your Kampground, lets take a look at what it takes to have a successful Kampground, which will lead to a successful, well managed safe kampground, that you can manage yourself. While your kampers cannot always be at your kampground on the ground, they can, and will become permanent residents of your kampground kloud. Website: You need to get the word out. The greatest kampground in the world doesn’t do you a lot of good if no one goes there. You need to keep your klients apprised of the current conditions and events. To provide klients a place where they can see ratings and reviews about your kampground. Klients want to be able to be interactive with you, and other klients. Klients, both new and current, love to read stories about their favorite kampgrounds. Before you make changes, it’s always best to get your klients opinion. 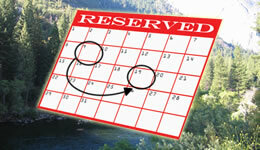 Reservations: Klients want an online, easy to use reservation system. No klient wants to drive for hours to a kampground, only to discover that there are no sites available. Klients also know, especially when kamping is in federal lands, that they are far from emergency services. Knowing that all of the kampers at the kampground have registered, and provided their licence plate number, makes the kampground far less attractive to those that want to take advantage of this situation, thereby making it far more attractive to them. Kommunties: Any successful kampground today needs to understand that “repeat business” doesn’t just happen. The best situation is for your kampers to join and be joined by other kampers who can schedule kamping dates, write about their trip and share their ideas and experiences. 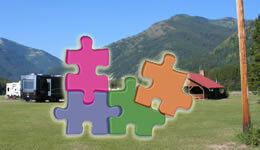 A kommunity gives your kampers the ability to set up and maintain their own groups based on shared interests. This will make your kampers always feel like their at your kampground , even when their back home at work. Their great kamping memories come alive when they visit the kommunities at you Kampground Kloud. While we’re sure your thinking sure I want a Kampground Kloud, but “I can’t afford that”, we think your going to be pleasantly surprised. The first thing is, our owner is a semi-retired computer scientist of 38 years. For almost all of those years he specialized in AI (artificial intelligence) in the area of programs that write programs. 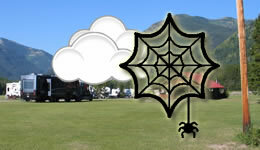 The RV Hobo Network, uses this experience to quickly generate your Kampground Kloud. Great care was taken in the design of the Kampground Kloud to ensure that it could be maintained by Kampground owners and personal. We use powerful Kloud Servers, expandable on demand. Efficient design based on those 38 years, ensures that the Kampground Klouds perform above comparable sites, while minimizing the resources required, keep your costs to a minimum. The worlds popular WordpressMU was chosen as it has proven ease of use by the millions of users that maintain their own website, blogs and stores. We then optimized its performance, and the performance of every one of our Kampground Klouds without you having to worry about it. Premium plugins from the worlds best designers are all available and part of your Kampground Kloud at no extra charge. With over 200 premium plugins available to you, along with hundreds of premium themes, you have the power to customize and add to your Kampground Kloud a snap. Vendors and bookings are fully integrated into the worlds most popular WordPress store, WooCommerce, opening up a powerful yet easy to use store with a fantastic shopping cart and payment options. When you sign up for your Kampground Kloud, you get access to the finest products available, and they are all included in your subscription. 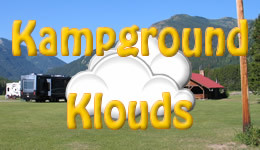 Did we mention, if your campsites are free, for a limited time, so is your Kampground Kloud! When you subscribe, you will simply uncheck the items you don’t wish at your Kampground Kloud. What follows are real, live websites, bookings and kommunities. Be sure to visit our Kampground University. We also understand that the worlds most feature rich Kampground Kloud can be a bit intimidating, that’s why we also let you uncheck any of the “BIG 3” so that you can start where your want to, and when you want to, and only with as much as you feel comfortable with. Then when your ready, you can add the pieces you want, when you want. No pressure, just support and a desire to give you the best experience on the Web! The RV Hobo Network lets the applications, not a salesman do the talking. No matter what your requirements, we’re here to help. It doesn’t matter if you want to have our staff of professionals handle all, some or none of the details of your Kampground Kloud, it is entirely up to you, with absolutely no pressure from us. And when and if you decide you’re ready to take over, and that includes right from the start, you not only have our Kampground University, you have a state of the art support center with support tickets, knowledge Base, Professional Q & A (Questions and Answers), rand a free support forum. And if that’s not enough, we can handle any modifications while you watch online. But that’s not enough! You can have the best kampground and even the best Kampground Kloud, but if people can’t find you, it simply doesn’t matter. That’s why we have tied in all of our Kampground Klouds with WordPress.com, the worlds largest blogging website. This insures your Kampground Kloud will be found by Google, Bing, Yaho and all other major search engines. Still More! You can tie your Kampground Kloud directly with your existing Social Media like Facebook, Twitter, InstaGram and so many more. Your konnections are already for you to simply put in their web address (url) and you have the power of Social Media driving new business to your Kampground Kloud, and right to your front door. Don’t worry, the Kampground University will show you how to optimize your Social Media and even create powerful accounts if you don’t have them. Not enough? we can do it for you for reasonable fees. SO stop waiting and start filling your kampsites today. Got Accounting? Your reservations system can fully integrate with most popular accounting programs like Quick Books, both desktop and online versions, and is fully integrated with PayPal. Coming soon, very soon, will be webcasts from Kampground U where you can participate in online classrooms with voice and video.